Description: Low perennial, from multicipital caudex; stems ascending, 10-15 cm high, finely retrorsely grayish puberulent, becoming glandular in the inflorescence; basal and lowest stem leaves usually withered at anthesis; stem leaves 5-8 pairs, linear, acuminate, 1-1.5(2) cm long, 1-2 mm broad, largest near middle of stem, finely glandular-puberulent, especially near the inflorescence; inflorescence few-flowered, often a single terminal flower, or one or two flowers developing from lower nodes; calyces 21-23(28) mm long, tubular, slightly constricted below, glandular-pubescent, 10-nerved, the lobes 2-4 mm long, membranous-margined and ciliolate; corolla scarlet, the claws glabrous, about 22 mm long, gradually and uniformly widening to 3-4 mm at top, scarcely auriculate, but abruptly narrowed to blades, blades about 8 mm long, bilobed 1/6-2/3 length, the lobes entire or rather deeply crenate, appendages located at least 1 mm above base of blade, 1-1.5 mm long, oblong, rather deeply crenate-lacerate; filaments well exserted; styles 3, exserted 2-4 mm; ovary one-celled. Flowering July and September. 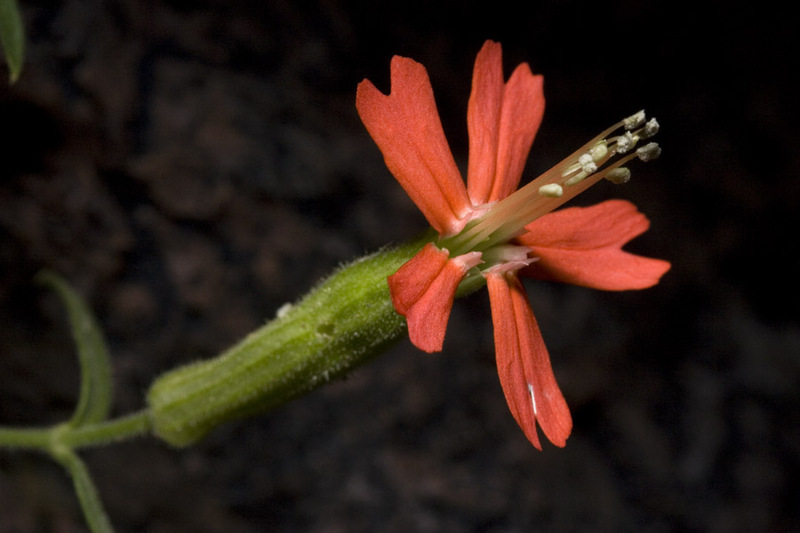 Similar Species: This plant is one of two catchflies in New Mexico with red flowers, the other being the rather common and widespread Silene laciniata, which has longer stems greater than 20 cm tall and often much taller, shorter calyx 1.5-2 cm long, and laciniate rather than bilobed petals. Distribution: New Mexico, Bernalillo, Dona Ana, Sandoval, Sierra, Socorro, and Torrance counties restricted to mountains near the Rio Grande; adjacent Texas, El Paso County. Habitat: Igneous cliffs and rocky outcrops; 1,500-2,800 m (5,000-9,200 ft). Remarks: This plant occurs in sporadic, widespread populations. Its distribution suggests that it may have been more abundant when the climate was cooler. Conservation Considerations: Its habitat is probably too isolated to make it susceptible to most disturbances. *Hitchcock, C.L. and B. Maguire. 1947. A revision of the North American species of Silene. University of Washington Publications in Biology 13.